What is it? Battle Chess given a veneer of strategy game, with Space Marines. In normal chess moving a knight out is a safe early move. In Regicide, I whip my knight into the midfield and into range of the boltguns carried by my opponent’s pawns. That knight does not last long. Regicide is two games in one. The first is chess but with characters from Warhammer 40,000, like the themed sets you see in the windows of board game shops only instead of the Mad Hatter and Queen Of Hearts it has Space Marines and Orks. ‘Classic mode’ lets you play normal chess against the AI or other humans, and while it might not be the best chess game ever made, like Battle Chess the pieces animate into entertaining miniature duels that make up for otherwise basic features. Those animations are as brutal as you’d expect given the setting—watching pawns blast each other to ribbons of gore livens up boring moves, at least until you’ve seen them all. But then there’s the other game. 'Regicide mode' keeps the rules of regular chess, even advanced stuff like castling and en passant captures, and sprinkles a light strategy game on top. After each turn plays out like it would in normal chess you enter the initiative phase, spending points to activate special abilities. A piece might gain a defensive shield, shoot at an enemy, use a psychic power, or throw a grenade. Each piece has hit points to be chipped away or reinforced by these abilities, but the initiative phase initially seems less decisive than the actual chess played in the movement phase. There, hit points don’t apply and one piece simply takes another in the ordinary way, albeit while eviscerating it with a chainsword or detonating it with psychic lightning. Regicide can be played as a one-off skirmish against the computer or a human opponent (online or hot-seat), or through a single-player campaign with a surprising amount of narrative development. It opens with a moody cutscene out of Dead Space and each of its 50 levels has a talking-heads intro as the Blood Angels chapter of Space Marines strive to take Hethgar Prime back from Orks of the Goff clan. These levels are like puzzles in chess books, giving you a set of pieces in an unusual layout and then, for instance, challenging you to take the queen without losing your own, or preventing your opponent promoting a pawn. This is where the pure abstraction of chess butts heads with the random-chance-to-hit tactics game. A level about getting my Marine Captain (king) across the board with only a squad of Tactical Marines (pawns) for protection drove me crazy as multiple attempts ended in disaster. It’s hard to know whether I’ve chosen a poor strategy or just lucked out when the king falls to a critical hit off a 52% chance, and that makes it hard to know whether to alter my plan or do the same thing again and hope for better luck. Little-known fact: all queens shoot lightning. As the kind of 40K nerd who recognizes Regicide as the chess variant played in the official novels while also realizing this game doesn’t resemble the descriptions of it, who knows the Blood Angels sometimes go into blood-drinking frenzies (and maybe eat brains), I felt obliged to play the campaign to see its story out. 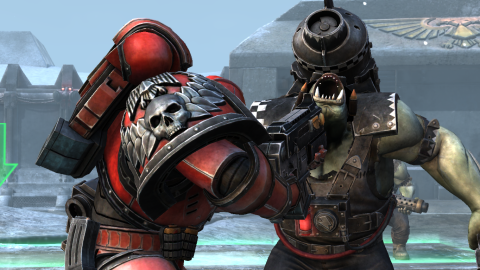 It’s the weakest part of Regicide though, even with voice actors familiar from the Dawn Of War series and comedy Orks named Rosenkrump and Gobstern. It’s better in skirmish mode, whether against the AI’s harder difficulties or actual people, where it becomes a kind of “chess plus”. Purists may see its layer of tweaks as an adulteration; to me they’re enough to reinvigorate my interest, tempting me to dig out that old teach-yourself-chess book to brush up on my game. It doesn’t say anything about boltguns. This hardly ever happens down at the chess club. Emperoricide doesn't have the same ring. This red mist used to be somebody. In the grim darkness of the far future, white moves first. I thought this was a friendly match.